Hanoi (VNA) – The Vietnam General Confederation of Labour (VGCL) is ready to share experience with and provide material aid for the Central Union of Cuban Workers (CTC), VGLC President Bui Van Cuong told Cuban Ambassador Herminio Lopez Diaz on August 30. At the meeting in Hanoi, Cuong said the VGCL and the CTC have continually stood side by side in international and bilateral activities, adding that the Vietnamese confederation has also wholeheartedly supported the Cuban people and State. He noted the VGCL is strongly reforming its organisation and operations with a view to contributing to national development and protecting labourers’ rights and legitimate interests. It will assist the CTC with 10 computer sets in the time ahead to help the Cuban side work more effectively, he added. 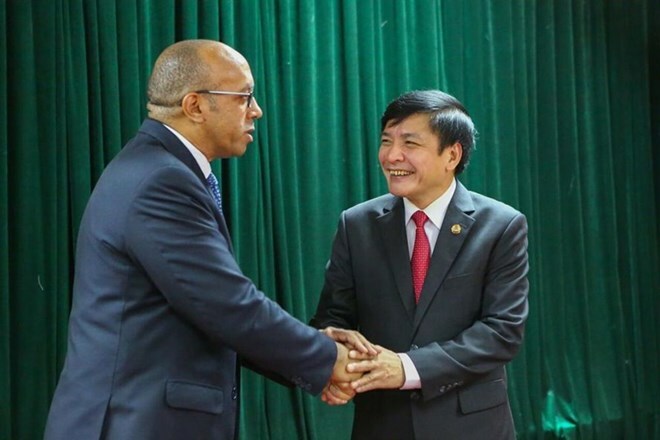 Cuong took this occasion to thank the Cuban people, Party and State for their all-out support for Vietnam’s struggle for national reunification in the past. Meanwhile, Diaz said as the Cuban Ambassador to Vietnam, he is often updated with information about the VGCL and the CTC’s activities and has also worked to assist their operations. Cuba is in a very important stage of development, he noted, adding that it wants to learn from Vietnam’s reform experience. Particularly, the CTC also hopes the VGCL will share more experience in protecting labourers’ rights.